The most common form of water damage comes from burst pipes and failed appliances. AF Environmental can help restore your property fast. Water damage from a failed water line is the most common form of water damage and affects 1 in 3 property owners. Chances are you will experience one during the lifetime of property ownership. These failures can happen in a variety of ways. Water line failures within your refrigerator, dishwasher, ice maker or washing machine are quite common. During the cold winter months, water supply lines also are at risk of freezing, which can create unexpected damage as well. Do not allow inaction to get the best of you. Water damage can be overwhelming, but the key is to respond quickly. The first step is to call a qualified and certified professional. The longer you wait, the worse the damage. Minimize the total damage by calling AF Environmental. AF Environmental is certified by the IICRC and fully equipped to respond to your water loss- any time of day. Open 24 hours a day, 7 days a week, our crews can respond to your emergency immediately. In addition, we are one of the industry leaders in Texas for emergency water restoration. We invest in only the best technology to help extract, dry and mitigate water damage in the least time possible. In cases where your insurance company is involved, we have dedicated staff to handle the claims paperwork- submitting the right photos and reports when needed. AF Environmental services the Dallas/ Ft. Worth metro area. Established in 2004, our service area includes but is not limited to the counties of Tarrant, Parker, Dallas, Denton, Collin, and Johnson. If you are dealing with an unexpected water loss, give us a call immediately. If it runs water, then you could be at risk of supply line failure at some point. Many of these appliance failures are attributed to old age, manufacturer malfunction or harsh, cold temperatures. 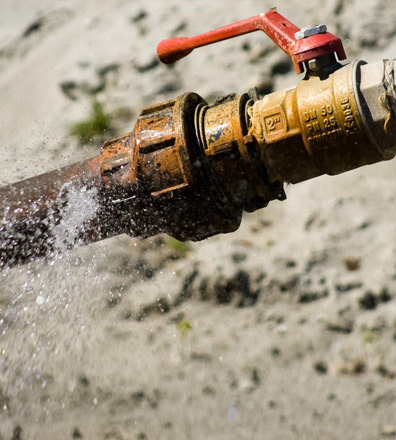 In the event a failed water lines affects your property, give AF Environmental a call. We are one of the few water restoration companies within the Dallas/ Ft. Worth area who has an extensive track record of success in water damage restoration. Our office is available to take your call regardless of the time of day. We realize emergencies can happen at any time of day and have the staff to provide immediate assistance. When it gets cold during the Texas winters, the water within your plumbing lines can freeze. The damage occurs when the water lines expand and contract from the freezing water inside. In some cases, the frozen water can expand to the point where cracks form along the pipeline. When temperatures raise above freezing, water damage can occur quickly. At AF Environmental we have found much of the damage occurs during the day- while homeowners are at work. Since temperatures are colder at night and warmer during the day, homeowners arrive home with unexpected water damage- sometimes with water running for hours. When unexpected water damage strikes your property, the next step is critical. Choosing a certified and professional company is key when ensuring your building is protected from mold growth or structural damage. AF Environmental is certified by the IICRC in water damage restoration services. We are also licensed, bonded and insured to handle projects of all sizes. Available 24 hours a day, 7 days a week allows us to respond quickly regardless the time of day. Equipped with a team of qualified technicians and a truck full of state of the art equipment, our crews can get in and out quickly- returning your life to normal.